Harriet and I have been doing some travelling around the world in recent years. See our travel blog on these places. Not only is it fun to travel but it means seeing new and often spectacular scenery and geography. It also means experiencing meeting people in new cultural settings and you realise there are millions of others around the world who live their lives in quite often new ways. They maybe largely ignorant of you and the way you live and where you even live. Some of the people we have met in unusual or casual circumstances. Staying in a 14th century restored Manor House in England on our trip to England in 2003. Walking through the Dodges Palace = 13th century on our Italy trip in 2005. 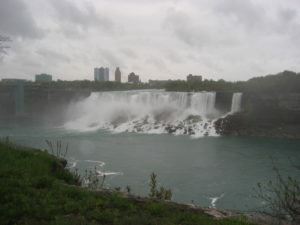 Niagara Falls May 2008 …..
coloured rain slickers to red. 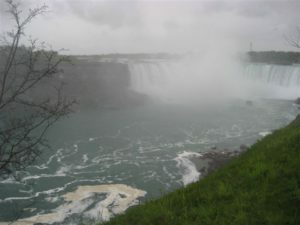 Horseshoe Falls, in Canada …. 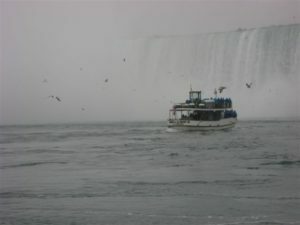 ….. Our friends let us off for several hours whilst we went on the ‘Maid of the Mist’ …..
….. the boat trip that goes right to the Falls and back again …. …. the Maid of the Mist’ Entry balcony with shops and coffee places …..
…. 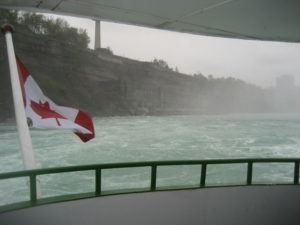 From up on Maid of the Mist’ Entry balcony ……. looking down to the river and Falls ……. 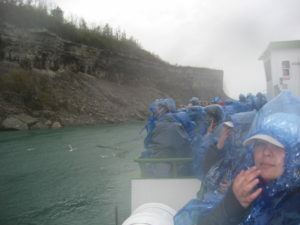 ….. the boat crew gave us light weight plastic ponchos to prevent spray going on our clothes …..
….. On the ‘Maid of the Mist’ finally … Fellow travellers in blue all looking at the Falls …..
See this YouTube Website of being on the Maid of the Mist and see this YouTube website as well. 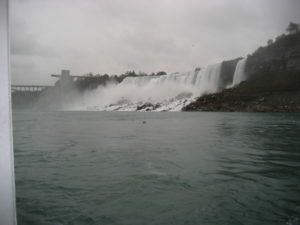 Different Views of the Falls …..
….. You couldn’t take many photos near the Falls as the wind and spray were everywhere …. The return Trip …. Looking back to the Falls ….. getting further behind ……. …. 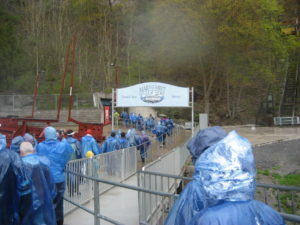 Going back to the ‘Maid of the Mist’ launch area …. the Canadian Flag undulates in the breeze ……. …. 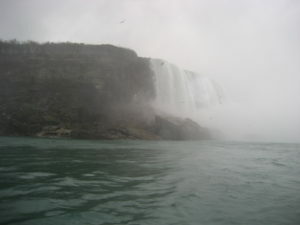 Coming close to the Falls on the boat …. we really needed the light plastic cover over our clothes ……. …. 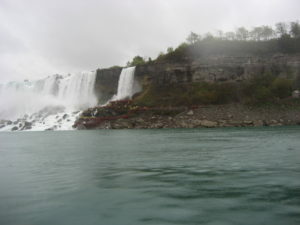 the Falls on the USA side …. also see the location map ……..
…. 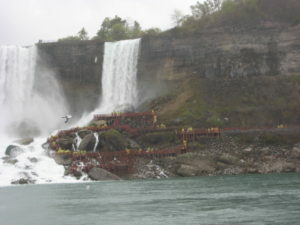 Niagara City Outline from the boat ……. to the Falls ……. 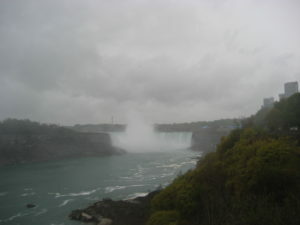 The American Falls ….. see this website also see the Cave of the Wind website. it was halted when it was worked out that the rock base was not stable enough for a bridge ..
See this website: Visit the American Falls There is a wonderful side view of this viewing area. …. Arriving back at the pier with next lot of blue – ponched ‘Maid of the Mist’ travellers ……. …. Walking back from the boat and up the to the entry at the top …..
Views you won’t have seen before. Niagara Falls Panoramic shot at sunset! This is absolutely incredible! Follow the directions. Experiment with all the features offered. Left click, drag, and zoom, (with your mouse wheel). You’ll take a helicopter ride, up, down, over- and-around, those great waterfalls at Niagara! Click on the helicopter icons in the background for different views..
We’ve certainly come a long way since the old Kodak Brownie camera days! There’s 8 separate views . . . See all 8 tiles. 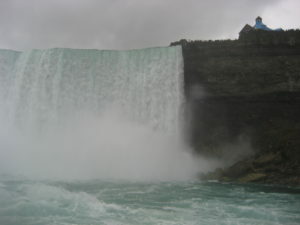 With the sound of Niagara Falls ….. you would almost believe you were right there seeing this magnificent waterfall.